Det kommer bli massor av musik, våfflor och annat skoj. 16:00 spelar Malmöbaserade Rosa Huset. 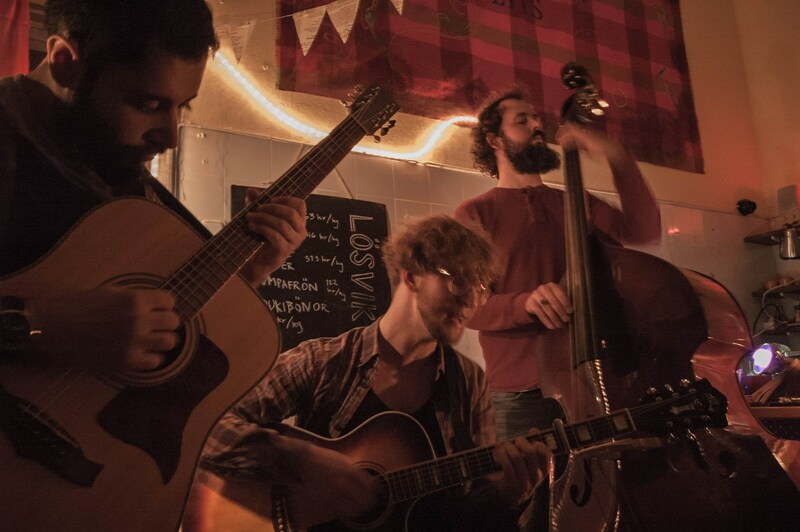 I Only Fight Giants is an international quartet with roots in Folk, Indie, Jazz and Rock. With four songwriters and multi-instrumentalists, hailing from Turkey, Sweden and the United Kingdom, I Only Fight Giants is a versatile setup which regularly features guest performances. Though born not long since yesterday, the quartet have already gained a following from gigging small and larger around Malmö and Copenhagen, and enjoy busking wherever the opportunity presents itself. The core of the band is Mehmet Ali Arslan (guitar/cajon/voice), Philip Hartman (guitar/flute/countless wind instruments/voice), Johan Rehnqvist (drums, alto & soprano sax, harmonica, voice) and Lloyd Degler (double bass/guitar/voice), all of whom are united in the noble cause to fight only the most giant in stature. I Only Fight Giants has previously had the pleasure of playing EkoLive, and has also played at Babel in Malmö, a number of smaller venues, and has had a number of performances at KoncertKirken in Copenhagen, most recently as part of Copenhagen Jazz Festival. Från I Only FIght Giants förra spelning på Ekolivs.